Judi Dench's character journeys to America, haunted by the loss of her baby son and traumas at the hands of nuns in the Magdalene Laundries. 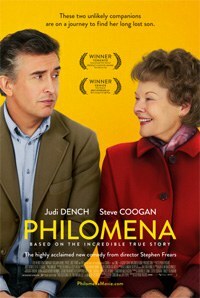 "I remember that day so clearly," begins Philomena (Judi Dench). And as she remembers, the exceedingly helpful Philomena illustrates exactly what she says. As her adult daughter Jane (Anna Maxwell Martin) and the journalist Martin Sixsmith (Steve Coogan) lean toward her over a restaurant table with a white tablecloth, Philomena recalls how she lost her baby son Anthony. This trauma was not unexpected: "We all knew what it meant when a big car arrived," she says," as the film shows the young and winsome Philomena (Sophie Kennedy Clark) looking out an upstairs window onto the driveway below. It meant that someone was coming to take someone else's child, a child born to one of the girls living at this prison-like convent at Roscrea, one of Ireland's notorious Magdalene Laundries. The film underlines the terror and helplessness Philomena feels in this moment, with the camera pitching as she runs up and down stairs, from room to room, her cries vivid and piercing. Blocking her is the film's embodiment of the most despicable Irish Catholic Church, the brutal Sister Hildegarde (Barbara Jefford), so imposing a presence that she makes fearful all the other denizens of this Laundry, the nuns and the "wayward" girls sent away by their mortified, impoverished, and otherwise marginalized families. As the camera watches from the upstairs window and the boy disappears into the waiting car, the film cuts back to Martin now, who duly mirrors your own reaction to this terrible story. And then, being a onetime journalist who's recently lost his advising job with the Blair administration, he agrees to pursue what happened next, to try to find out where little Anthony ended up. To fund the venture, he convinces a former editor that no matter the outcome -- tragedy or happy ending -- the story will be great human-interest-weekend-section material. Just so, the film acknowledges the careful and conventional structuring of the story on which it's based, the real-life Sixsmith's article and book, and then proceeds to deliver to several other sets of movie conventions, as the odd couple Philomena and Martin bond during a road trip to the US, while also uncovering particularly American culpabilities too, including a profitable trade in babies between the US and the Irish Catholic Church. Here the film indulges in an odd device, showing home movies -- some reenacted, some reportedly footage of the real-life boy -- to ensure that you share Philomena's regret and nostalgia for a child's life she didn't witness. This all to make you good and sad by the time you learn what happened to the grown-up Anthony, renamed Michael by his apparently loving adoptive parents, when he finds a job with the Reagan administration, and... wait for it… he's gay and closeted during the rise of AIDS. The several plotty turns here are rendered in ways you might expect, discoveries made in google searches or sometimes in face-to-face interviews; one with Anthony's adopted sister Mary (Mare Winningham), another child taken from Roscrea, offers a bit of aptly resonant awkward silence, with Martin's expressive face -- sad, aghast -- again reflecting your own. More often, though, exchanges are chatty and revelations are spelled out. In between the search into her son's history, perky Philomena also discovers present-day America, including hotel breakfast muffins and VOD, which delights include Big Momma's House, in which "little black man pretends to be a fat black lady." As Martin smiles, sort of, here, you might appreciate Philomena's endlessly optimistic view of the world, her unquestioning faith in God despite what's befallen her, and her determination not to be cynical like her traveling companion. Certainly, Dench's mostly subtle performance yields many layers not written into Philomena's dialogue: she's not given to self-reflection per se. But still, Philomena cannot leave this well enough alone, and so repeatedly over-explains the significance of discoveries along Philomena's Forrest-Gumpily episodic family history, with poignant close-ups and obvious soundtrack cues or those home movie bits. Here the traumas become individual moments, as the evils of homophobia and misogyny (to name two) appear as moments on a timeline, institutional and cultural panics now declared over, steps along the paths of Philomena and Martin's mutual educations. As she comes to see that his adamant atheism is something like a forgivable character quirk, and as he is inevitably inspired by her gumption to rethink his own cynicism, they come together in a lovely melodramatic flourish that resembles the melodramatic plots of novels she likes to recite as evidence of the wonders of human adventures. That Philomena or Martin might find solace in such familiar and clearly remembered stories is one thing. That the movie follows suit is another.